We landed in Port au Prince and walked out of the airport into what felt like a hot 90 degree summer day. Perhaps it was because it was actually 90 degrees, or maybe because of the long sleeves and jeans I was wearing to protect me from the 40 degree chill we left in Washington DC that fall morning. I was part of a group of seven of doctors and nurses from northern Virginia that arrived in Jacmel, Haiti on Nov 5th for a medical mission. Our mission was simple: to work with the local doctors, clinics, and hospitals to help provide quality healthcare to some of the vulnerable population of Haiti. Our group was made of two parts. The surgeons and anesthesiologist would spent their days at the hospital performing operations while myself, two other family physicians, and a nurse, spent our days working at the local primary care clinic. 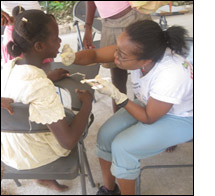 Since the earthquake of January 2010 there had been increasing need in the area, and Community Coalition for Haiti responded. Their free clinic is staffed year round by two full time Haitian doctors along with some nursing and office staff. However, the needs of the area are great, and they appreciated the additional help our team was able to provide. Every day we would walk in to a waiting room full of 50-100 patients waiting to be seen. Many came early and were willing to wait as we worked through the large numbers. We treated chronic diseases such as hypertension, more exotic illness such as typhoid and malaria, dermatologic infections such as impetigo and fungal skin infections, as well as mental health ailments such as depression. Without the ease of readily available labs, my clinical skills were sharpened. We were able to provide care to hundreds of patients that week. For those requiring chronic care and follow up, we stressed the importance of continuing to follow up at the clinic. We practiced the full scope of family medicine by providing primary care, performing procedures, and giving gynecologic care when needed. As is not uncommon on such trips, we went with the plan to bless the people of Haiti with our skills but returned feeling blessed by them. Most striking to observe was the strength and resilience of the Haitian people, despite all that had happened in the country over the last 2 years. For me this trip was particularly special as this was the first time since infancy that I had been back to Haiti, where my parents were born and raised. To have the opportunity use my skills, working side by side along the Haitian doctors and clinic staff to help other Haitians in need was truly a blessing.